Last year, the European Commission released a proposed Directive on Copyright in the Digital Single Market, Article 13 of which would require all online service providers that “store and provide to the public access to large amounts of works or other subject-matter uploaded by their users” to reach agreements with rights holders to keep allegedly infringing content off their sites – including by implementing content filtering technologies. We’ve talked at length about the dangers of this proposal, and the problems with filtering the Internet for copyright infringement. For one thing, it’s extremely dangerous for fair use and free expression online. This week, two EU-based organizations are calling on Internet users to stand up for their rights to lawfully use copyrighted works, and to call on the European Parliament to remove Article 13 from the proposed directive. Bits of Freedom, a Netherlands-based organization, launched a campaign website where you can “save the meme” by contacting an MEP and urging them to delete Article 13. The site calls attention to the proposed directive’s impact on popular legal uses of copyrighted content, “like parody, citations and –oh, noes! – memes,” and provides a handy tool for getting in touch with your MEP. 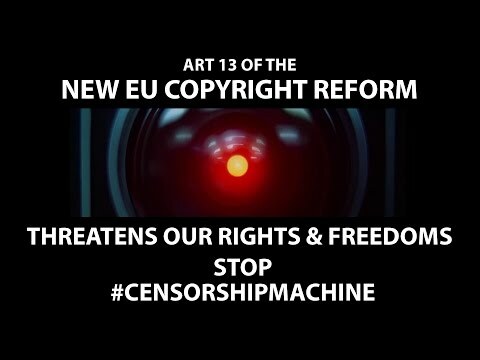 Simultaneously, the activist group Xnet, with support from EFF, EDRi, and several other digital rights groups released this video highlighting how Article 13 would give copyright holders the ability to censor a wide swath of online expression. There’s still time to stop Article 13 before it becomes law in the EU. The proposed directive must pass through several more rounds of review by European Parliament Committees, followed by an informal “trialogue”, where the European Parliament, the European Commission, and the Council of the European Union try to agree on the text of the directive, before it finally moves to consideration by Parliament. If you’re in Europe, you can take action to stop Article 13 by going to savethememe.net. If you’re not, you can share that link with your European friends.